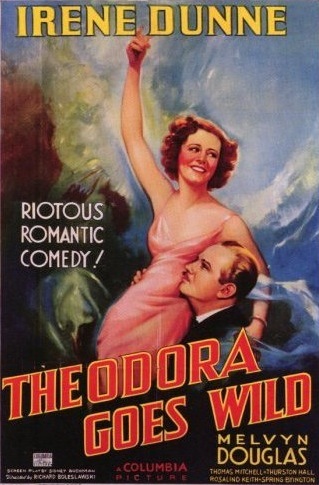 One of the many wonderful comedies made during the Great Depression, Theodora Goes Wild explores a young woman’s quest for freedom in a society where tight constraints are the norm. The film’s humorous and entertaining look at some of the hang-ups of the period is a very fun way to spend about 90 minutes. Interestingly enough, we discover that not many things have changed since. Gossip still rules, small town folk are always too interested in each other’s lives, and people still yearn to live their lives the way they see fit. Theodora Lynn, a respected daughter of the town’s prominent family, has written a book called “The Sinner”. It’s a wildly successful look at the life of an imaginary woman who does things her own way, very much unlike Theodora. She has penned it under the name Caroline Adams, to protect her identity. Meanwhile, the town is in an uproar over the scandalous morals of the book’s main character, all the while unaware that the very same young woman that plays the organ in church every Sunday morning and obeys her aunts to the letter is the author of said scandalous book. Theodora visits her publisher on an occasion, and while there, meets Michael Grant, played by Melvyn Douglas, a debonair artist who works for the publisher but is very informal. He takes an immediate liking to her, and coaxes his way into having dinner with her and the publisher that evening. During dinner, he gets her to drink (which she never does) and as she unwinds and lets loose, he enjoys his little game more and more. He decides to pursue her back to her town and “free” her, as he puts it. He succeeds, but he has unleashed a force greater than him. She now intends to “free” him. The film’s gloriously funny twists and turns had us in fits of laughter throughout. And the skewering of the old biddies in that small town was great fun too! The film showcases Irene Dunne’s incredible talent for comedy and sexiness (it’s no wonder she made such a great on-screen pair with Cary Grant), and fits Melvyn Douglas to a tee. He has an endearing quality that shows through his devilish smirks and his on-screen antics. That same quality made him perfect for the role of Leon in Ninotchka (opposite Greta Garbo) three years later. I can safely say that he’s become one of my favorite actors. Just one year later, Irene Dunne made The Awful Truth (1937) with Cary Grant, one of my all-time favorite movies. It’s so funny to see her honing and refining the same skills she used to great success in that movie while watching this one. The same little trills of laughter, the same thin smiles, the same looks, glances… It’s wonderful to catch great actors doing some of their best work. It’s time well spent to watch them act. There’s an important lesson to be learned from the movie as well. It’s easy to forget nowadays how stifling society used to be, and how scandalous certain behaviors were considered just a few decades ago. To some extent, that was a good thing, but it must have driven some people mad with frustration. Nowadays, things are much more relaxed, although we still tend to be judgmental. It seems we always want to tell others what to do and what not to do. Sure, it’s important to point out what’s morally and ethically wrong, but that’s the duty of our parents and families, NOT our neighbors and townsfolk. I don’t believe in the saying that “it takes a village to raise a child”. No it does not! That sort of a village would be the quickest way to get me to rebel if I were still a child. It’s also important to point out that while Theodora rebelled against the gossipy old biddies and against society, she did it all with a purpose, all while not compromising her own morals. She did not demean what she saw as her true worth. She simply put on a show to prove a point, and she certainly proved it. That’s something to keep in mind for the young people of today, who are so ready to step over any rules they might have set to get at what they want. Sometimes there are horrible consequences to that sort of behavior. If you watch the movie, you’ll remember that Theodora kept “both feet on the ground”. Keep that in mind. Have your fun, achieve your dreams, prove your point, but don’t do something you’d later regret. Previous Post Wondering why I write less these days?